That's Ok, T. The Book's Still A Bestseller. Wind windbag Pickens has seen better times. Caught on the wrong side of energy investments and leverage, his 30% and 84% losses in two funds have cast over $250 million of his personal stash to the winds and left investors another $750 million shy. To hear him tell it, the sudden dislocations in the energy market over the last three months caught him unawares. But don&apos;t worry, its all temporary. (Sort of like the sudden spike in energy markets the three months before that? One man&apos;s unfortunate dislocation is another man&apos;s genius thesis). 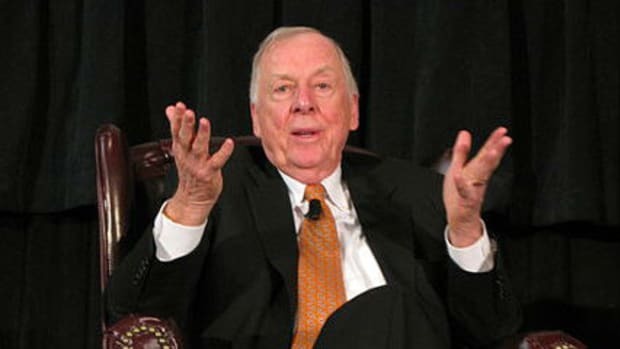 Pickens insists that "Oil likely will finish the year around $120 or $125 a barrel." If he really thinks so, wonder why he reduced his exposure to energy so dramatically when it toyed with $90. Between this and that whole Yahoo thing, we wonder if our favorite oilman should spend less time standing on a soapbox and more time with his analysts.